For about a mile into the hike along Lake Zoar the water is tantalizingly close but access for your dog is problematic due to high banks. Then, out of nowhere, you reach a small sandy beach where your dog can glide into the cool waters. 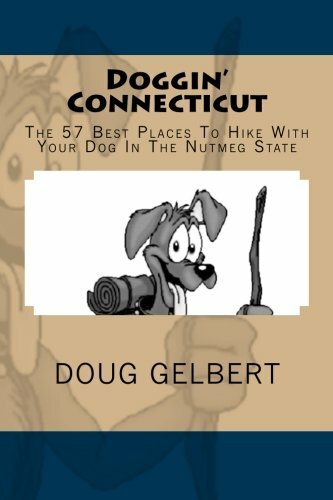 The prize for adventurous dogs is Cobble Mountain with its splendid vews to the west across the Hudson River to the Catskill Mountains. The trail trips along exposed cliff edges for a good distance on the way to the 761-foot summit and its south-facing vistas. It takes a mile hike to reach Bushy Point Beach and it is only open to dogs from September 16 to April 14 but it is worth the trip and worth wait. The largest state forest in Connecticut harbors the best short trail through blankets of ferns, Eastern hemlock and Atlantic white cedar in the Rhododendron Sanctuary. yOur dog will be dwarfed by the magnificent thickets of native rosebay rhododendrons over ten feet tall. The Mattatuck Trail visits the Leatherman Cave, one of the rock shelters used by an itinerant traveler from the late 1800s, clad totally in leather, who moved among Connecticut villages for 25 years. The country lane rambles of the estate known as Stanerigg cover miles across wooded bumps and acres of fields. The canine hike around Burr Pond, almost universally wide, often flat and traversing airy hemlocks and yellow birches is the best circumnavigation of a lake in Connecticut. Almost 40 miles of marked trails criss-cross the property and your dog can find himself trotting across almost anything under the heavily wooded canopy - cobbles, packed dirt, smooth rock, boardwalk.